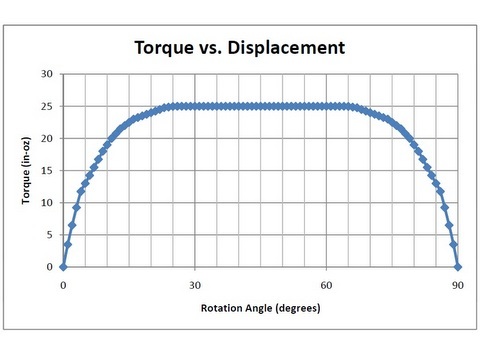 Santa Clarita, CA – Motion Control Technology – The Limited Angle Torque Motors or “Torquers,” technology explained: A current carrying conductor placed in a magnetic field will have a force (or torque) exerted on it. This force is proportional to the direction and magnitude of the current and the flux density field. Since the permanent magnet flux density field is fixed, the direction of the rotation depends on the polarity of input current and the amount of torque that is produced is directly proportional to the magnitude of the input current. The torquers are typically supplied unhoused without bearings or a shaft, but can be supplied housed if required. Coupling the torquer to your bearing system and a rotary encoder or other feedback device yields a system that is capable of intricate angular position, velocity, and acceleration control. Low moving inertia of the rotor assembly allows for high angular acceleration of the payload. The small length to diameter ratio allows the torquers to fit in spaces where conventional rotary brush and brushless DC motors will not. It should be noted that, angular excursions of greater than 180º (up to 360º) can be achieved by modifying the winding of the stator assembly. In this case the coil assembly will have 4 leads and it will have to be commutated. H2W Technologies offers 2 distinct types of limited angle torque motors. 1. MR Series Limited Angle Torque Motor – is a toroidally wound iron core stator with a 2 ,4 or 6 pole permanent magnet rotor. This torque motor can provide angular excursions up to 180º. It is typically supplied without bearings, shaft or housing to allow for direct mounting to customer supplied bearing system. The MR Series is comprised of a toroidally wound, stationary, coil assembly with a multi-pole permanent magnet rotor. Rotor: The rare earth permanent magnet rotor always has an even number of poles, with any where from 2 to 6 poles. The maximum angular excursion with a 2-pole rotor is 180º, with a 4 pole rotor is 90º, and with a 6 pole rotor is 60º. The torque will drop off to zero at the extreme ends of the travel. For constant torque over the required rotation, the angular excursion will always be less than numbers mentioned above. The rotor assembly is installed within the ID of the stator assembly. There is a magnetic attractive force between the stator and the rotor. When the stator is perfectly concentric within the rotor, the radial magnetic attractive forces are equal and opposite and they cancel each other out. Stator: The stator is comprised of a “soft”magnetic steel toroid that is electrically insulated. Multiple sections of insulated copper magnet wire are toroidally wound on the stator toroid. Only 2 leads are brought out from the stator assembly. 2. WR Series Limited Angle Torque Motor – is an arc segmented multipole permanent magnet stator with a low inertia copper magnet wire rotor. Angular excursions are typically less than 90º. This torquer is supplied with out a shaft or bearing. The WR Series is comprised of a stationary, arc segmented, multipole permanent magnet stator assembly with a low inertia wound wire rotor. The WR Series Torquers are available in 2 configurations. H2W designs and manufactures a wide range of linear motors, positioning stages, and fully integrated single and multi-axis positioning systems. We will be happy to assist you with a custom design if you do not find a standard product that meets your needs. Semiconductor, Medical, Military, Aerospace, Material Handling, People Moving, Amusement Park Rides, Packaging, Automotive, and Clean Room.